Welcome to StraightGolf, your one stop shop to learning every aspect of playing golf. I’m Michael Perry, Qualified PGA Professional with over 20 years of experience in teaching golf. I offer one to one Professional PGA Golf lessons in Chingford London, from the fantastic Chingford Golf Range, near Stratford. With easy access from Ilford, Enfield, Chigwell, Theydon Bois, Epping and the South of Essex. The range also lies in zone 6 of the London Underground and Chingford main line station which is 20 minutes from London Liverpool Street Station. Do you want to learn the game simply? Working step by step with the use of video, you will be able to learn vital elements of the set up and swing and the right amount of information to digest. This allows you to learn and not get confused or focused on things you don’t need to think about. Do you want answers to the problems with your golf game? By working with video to analysis, I can make use of my 20+ years of experience to say what’s going wrong and how. My GC Quad will give incredible feedback from what the club and ball are creating and my BodiTrak is amazing at showing your weight and use of it. With all this help, all answers can be answered with proof. Would you like to see what’s going wrong in a simple to understand way? With the use of video, GC Quad and BodiTrak, I can easily show what’s going wrong and how it is affecting your golf. These devices show everything in a simple to understand way. Have you had enough of struggling with your game and getting nowhere? By learning a bio mechanical approach to golf, you will gain confidence in knowing what you do to create the right results. This approach gives consistency and accuracy in the shots and sometimes much more distance as a bonus! Do you hit it well at the range and not on the course? Your inconsistencies on the golf course are due to only being able to hit one ball and being under pressure to hit the right shot. However, the right shot is only created with a bio mechanical process, such as I teach. Hitting balls on a range only helps your faults to work, but under the pressure of the course, this simply isn’t enough. By working bio mechanics into the swing, you create consistency and accuracy. Sick of mishitting or slicing the ball? By using video and my GC Quad launch monitor I can give you clear understanding why the action of the swing isn’t effective and then changes can be made to create consistency and accuracy. 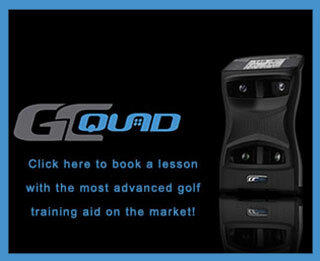 Using the GC Quad will allow us to change your technique and then help show the improvement with its clubhead tracking technology. No more slicing and mishitting! If you answered YES to any of my questions, then press the Book a Lesson button and I can give you the answers you need. I can show you how and where to put things right. Trust in my 20 plus years of continued learning and experience as a PGA Golf professional.